Just imagine how much fun your child will have with this Plush Webkinz Stuffed Animal from Ganz. This soft and cuddly animal is ready and waiting for you to adopt him. 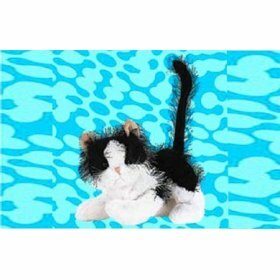 What makes Webkinz so special ..
Just imagine how much fun your child will have with this Plush Webkinz Stuffed Animal from Ganz. This soft and cuddly animal is ready and waiting for you to adopt him. What makes Webkinz so special is the secret code you receive when you purchase them. This code allows you to go to the webkinz.com website and formally adopt your animal. You get to name them and bring them to life in the Webkinz World Website. Your child will then be able to play on-line with their pet by designing their room and purchasing all kinds of items to furnish it with using virtual Kinzcash. You receive $2,000 in Kinzcash when you purchase an animal and by playing games and answering trivia questions. There are also educational and fun games your child can play to earn more Kinzcash too. The games are designed to be age-appropriate for your children and have different levels for them as they grow to provide years of fun and excitement.